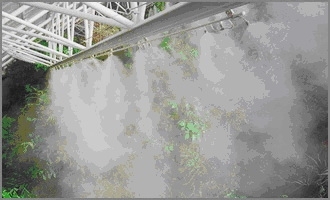 Fog systems generate high volumes of super small water droplets as fog. The fog evaporates cooling the air inside the greenhouse. Fog systems should be used with natural ventilation since once the fog has evaporated and the air is saturated, no further cooling is possible without introducing hot dry air from the outside. Propagation and germination processes may be improved at the 90% humidity level created by fog systems. The disadvantages of high humidity are that it can quickly cause premature rusting in the greenhouse and can create an environment that aids in proliferation of certain diseases.